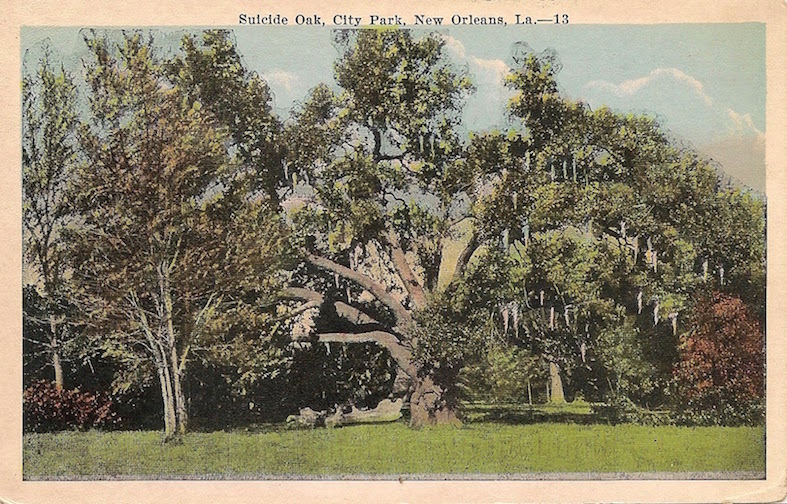 I received this old postcard today and was struck by the caption, Suicide Oak, City Park, New Orleans. I wondered if the city of New Orleans had since cleaned up its act and renamed the tree; in California, where nobody ever dies, and you only transition, they would call it the Transition Tree. Or maybe they would be more explicit and suggest that you had transitioned for a reason, for example that you had issues going forward. So in California it would be the Issues Going Forward Transition Tree. I checked out New Orleans and to my surprise and pleasure this is still the Suicide Oak. It looks like the sort of tree made for suspending yourself from, but apparently not; the tree was a popular place for taking poison or blowing your brains out. But the tradition seems to have died out, as you can see for yourself. 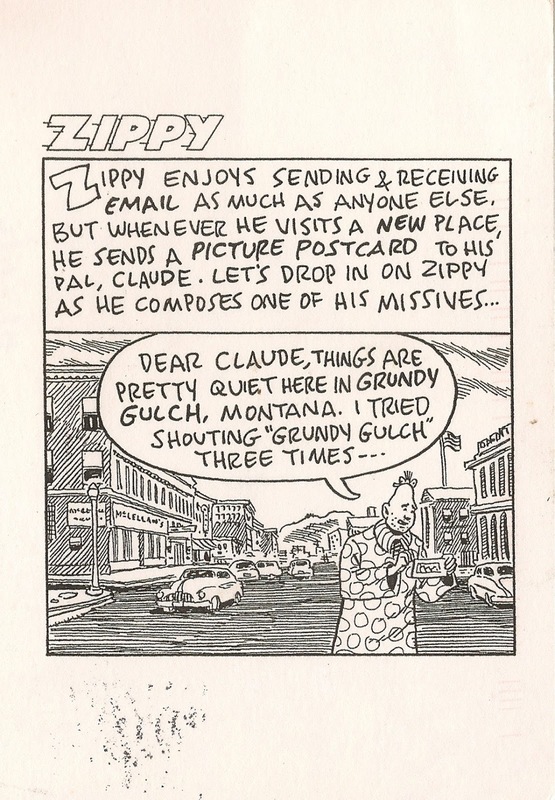 Zippy on the art of sending postcards. Zippy the Pinhead has something to say about sending postcards as he explains on this postcard that I received from a friend of Zippy's not long ago. This friend of Zippy's and I have been sending postcards to one another for a very long time now, always when we go to some new place but any excuse will do. The Suicide Oak postcard today inspired me to look over the postcards I have received during 2014. Some are beautiful, most are interesting, and some like this postcard from Rockville, Connecticut are sublime. 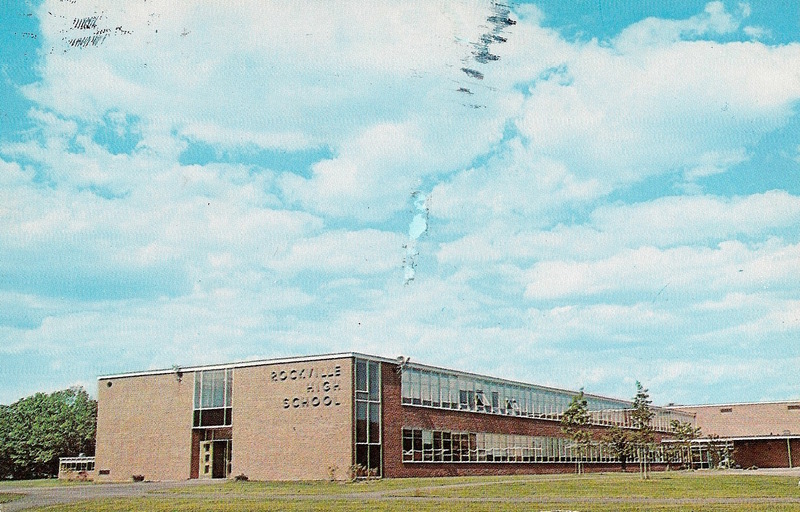 Postcard of Rockville High School, Rockville, Connecticut. Then there was a friend's great adventure to Holland which rewarded me with postcards from Amsterdam, Delft and Den Haag. 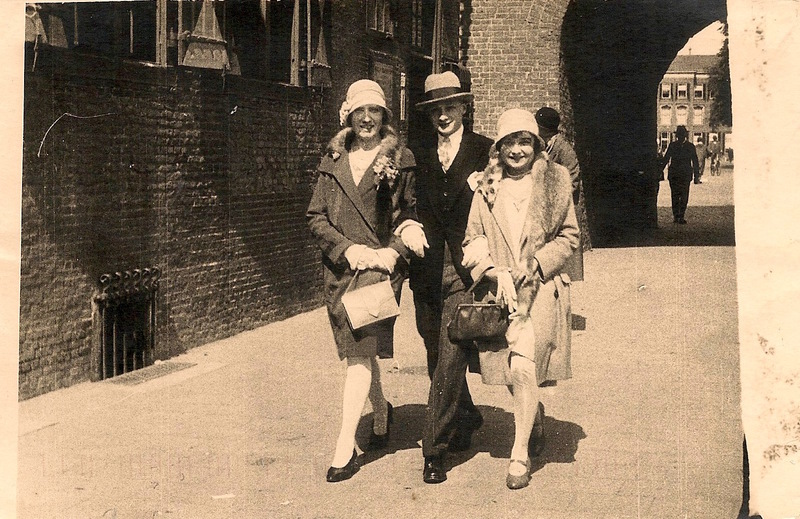 At a flea market in Delft he found this postcard of three fashionable people in the precincts of what looks like the Mauritshuis in Den Haag, the musuem of the Dutch Golden Age. It has ten paintings by Rembrandt and three by Vermeer (out of a known thirty-four), including Girl with the Pearl Earring. Alongside the Mauritshuis, Den Haag: vintage postcard. Another thoughtful friend, knowing that I have been writing a book about Mary Magdalene, sent me a postcard showing Jesus and La Magdalene herself in Christus Gardens, Gatlinburg, Tennessee. There used to be another site in Gatlinburg called Tour Thru Hell featuring villains such as Pontius Pilate, and also a place with performing chickens that walked a tightrope, played basketball and played the piano. 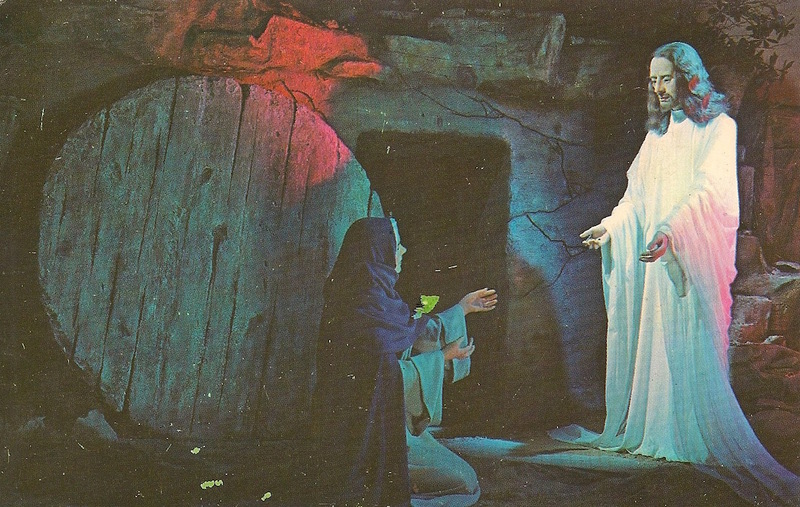 Postcard of Mary Magdalene and Jesus in Gatlinburg, Tennessee. Alas they have all gone out of business, but Christus Gardens has in a sense been Born Again at Christ in the Smokies. If you cannot make it to Gatlinburg you can always go to Vézelay in Burgundy which has some of Mary Magdalene's ribs or to Saint Maximin in Provence which has her skull. As for the chickens, they come and they go. 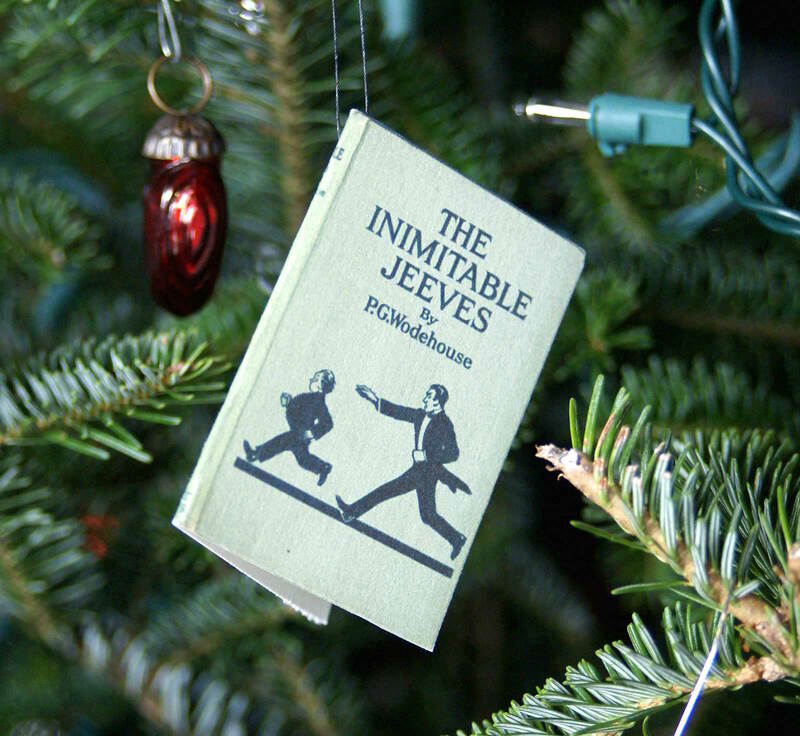 An English Christmas would not be complete with a good murder or two. My friends in Connecticut, Jon Buller and Susan Schade, are having something of an English Christmas this year. Jon and Susan are 'les chatelains de Mont Becket' to whom I dedicated The Templars: History and Myth. 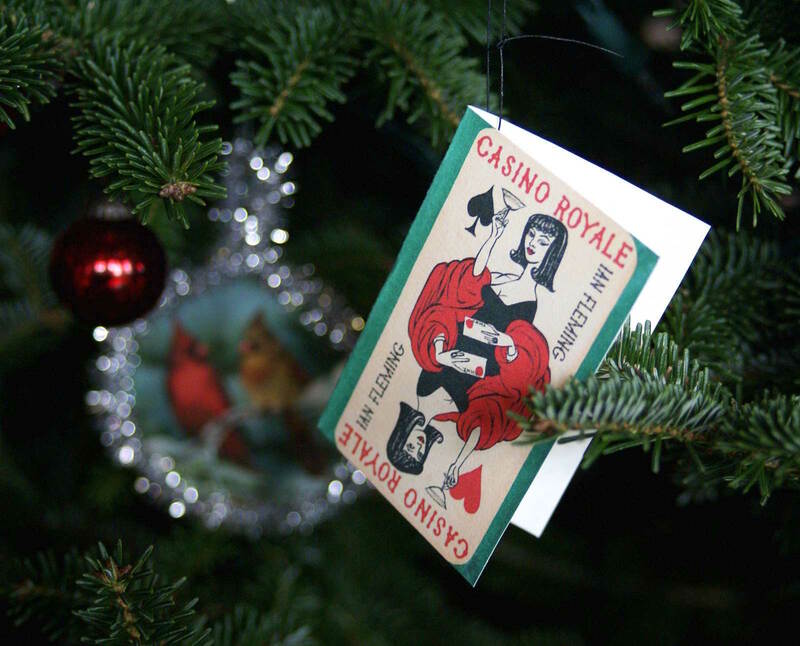 The idea began with Susan who was making the decorations for the Christmas tree. Her decorations are miniature covers of books, all of them in English and from the British Isles. Not surprisingly many of the covers are from children's books; Susan and Jon write and illustrate children's books. And others are from detective novels; when not writing children's books, Susan reads vintage detective novels. 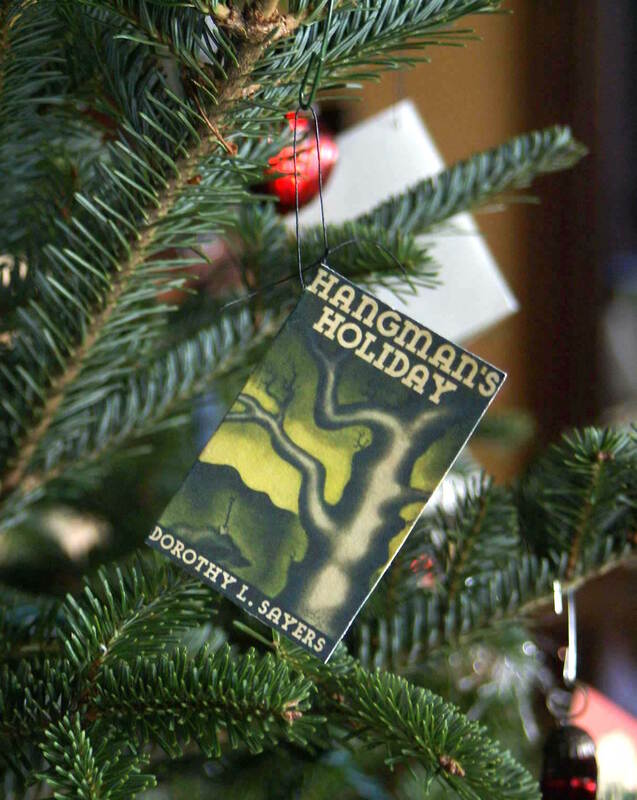 For example, the tree is decorated with the cover of Hangman's Holiday by Dorothy Sayers. An English Christmas would not be Christmas without a good murder and Hangman's Holiday is a cracker full of murder mysteries. Jon has contributed a Rupert Bear Annual but otherwise he is not well represented on the Christmas tree as he reads things like A la recherche du temps perdu which Marcel Proust wrote in French. It is a book in which nobody gets killed. In fact very little happens at all. Bertie Wooster stories first published in 1923. 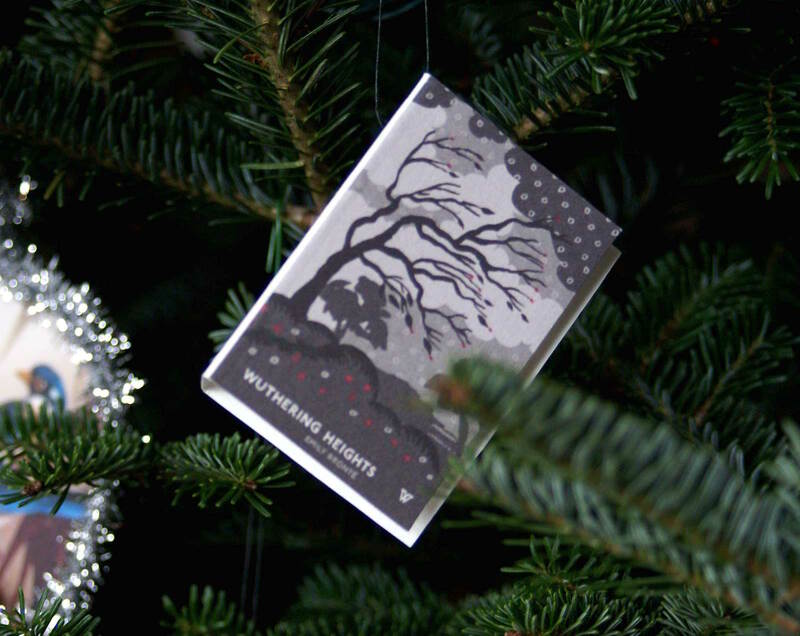 The tree is also hung with the covers of Burns' Poems, The Recipe Book of the Mustard Club, Dylan Thomas' A Child's Christmas in Wales, and Ruthven Todd's Space Cat on Mushrooms. I got curious about some of these titles and looked into them more. As I might have guessed The Recipe Book of the Mustard Club was anonymously written by Dorothy Sayers in 1926 when she was working as a copywriter for S H Benson, the advertising agency handling the J & J Coleman mustard account. The editor was Sayer’s husband Atherton Fleming who wrote newspaper columns under the name ‘Gourmet’ and originated and tested many of the recipes. The contents include Fish Stories by Miss Di Gester; In Praise of Pig by Lord Bacon; Mutton and Beef by the Baron de Beef; Fair Game and Fowl by Augustus Gusto; Good Cheese and Good Cheer by Signor Spaghetti; Sandwiches by the Mustard Club's Travelling Correspondent; Sauces of Domestic Happiness by Lady Hearty; and Pickles by One of Them. The first James Bond novel 1953. 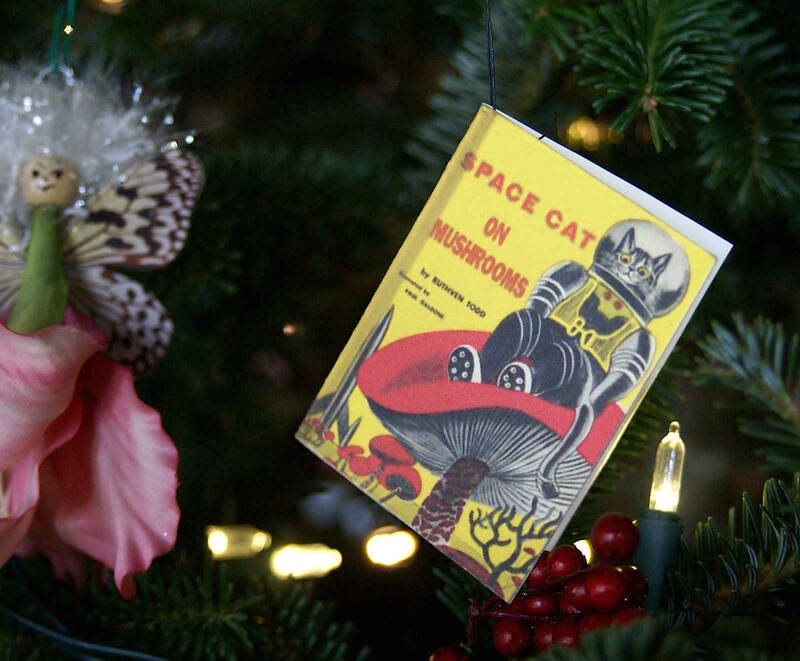 It took me a while to wake up to the connection between A Child's Christmas in Wales and Space Cat on Mushrooms. A Child's Christmas in Wales by Dylan Thomas grew out of a BBC radio piece of the 1940s and was finally published under its own title in 1955, two years after Thomas died of alcoholism in New York at the age of thirty-nine. Ruthven Todd, a Scots poet who also wrote detective novels and children's books, was a close friend of Dylan Thomas' and was with him at his death, about which he wrote a harrowing account. With Space Cat on Mushrooms either Susan is pulling our leg or someone is pulling hers; the real title of Todd's book is Space Cat Meets Mars but encouraged by the mushrooms which belong to the original cover illustration someone has tinkered with the title. 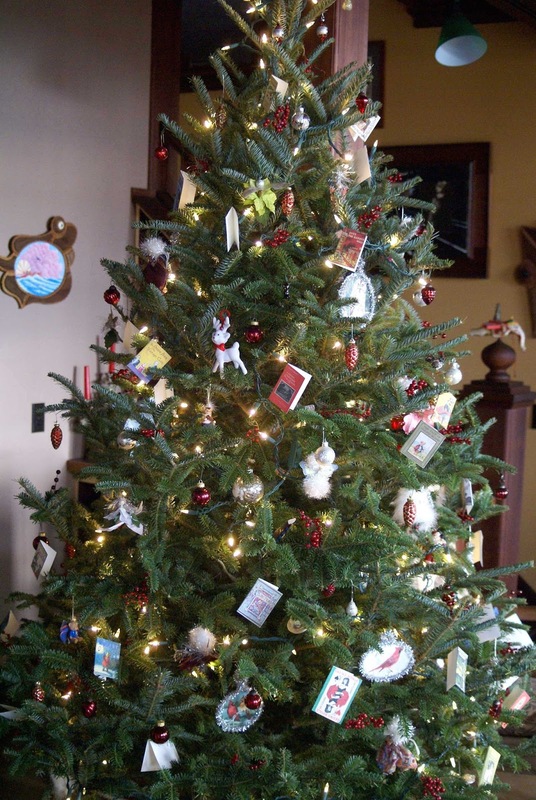 Anyway, one thing led to another, and no sooner did Susan have her tree decorated than she thought she and Jon would have a Christmas Eve dinner at which everyone could come as a character from the sort of books decorating the tree. So far they have Simone showing up as Irene Adler from Sir Arthur Conan Doyle's Sherlock Holmes story A Scandal in Bohemia, Aven coming as Mina Harker from Dracula, Lynnie as Agatha Christie, and Ellanora will come as Matilda's mother in the eponymous children's book by Roald Dahl. 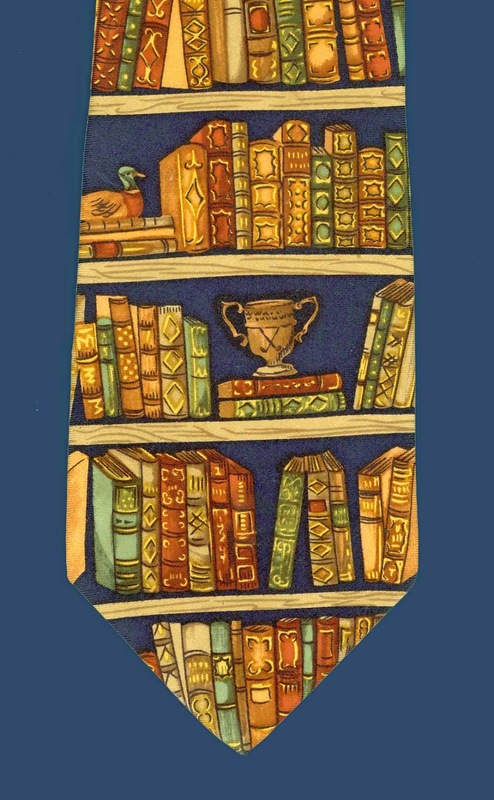 Jon is thinking of wearing his bookshelf tie and coming as Salman Rushdie. A dose of insanity for a merry Christmas.